The world must be ending. Surely this can be the only explanation for why the toy gods have finally seen fit to bestow upon us modern updates on the Generation 1 Autobot and Decepticon clones. But wait, there’s a catch – Hasbro have made them incredibly tough to buy. Well, two of them anyway that are only available in tough to find box sets on the other side of the planet. So that leaves us with the other two, Cloudraker and Wingspan, released as a stand alone two pack this is absolutely how all four of them should have been done. Mostly because I am still bitter for not being able to get the others. So do new these Clone figures justify repeated refreshing of Amazon.com in the hope one of the other box sets will drop into stock? Continue after the jump to find out. We kick off with Cloudraker whose jet mode resembles something from one of those other toy lines your gran thought were knock off transformers. Real world vehicle design had no influence on the 80’s clones and the 2017 editions march to that same beat. It’s a vaguely triangular space jet with an ice lolly for a nose. Cloudraker is still the standard charming pile of parts cribbing hard from the Jetfire playbook. His arms sit on the back and the ball joint sockets can sorta pass themselves off as intakes if your imagination isn’t still in your draw at work. Legs swing out to the sides with the best intentions to peg in, but don’t. Doesn’t ruin anything so as he’s so small and compact he holds together just fine anyway. Trying to fill a paragraph on the play features is tough work seeing as there really aren’t any. His chest can flip up into a seat to make a Titan Master look like he’s sat on a kiddy ride outside the supermarket, there’s a landing skid and some hinged wings that slump with a depressive sag. Stick Eeyore in Moonwalker and this is what he’d transform into to try and zap Joe Pesci in those tiny round bottle cap glasses. Plug a figure stand into the compatible port on his back and you could even get him doing the Smooth Criminal lean. Without one head topple over like he’d been hit by, he’d been struck by a smooth…eh you know the rest. Hasbro didn’t need to borrow many of Neil Buchanan’s paints for Cloudraker. The original toy went largely with stickers, so it’s odd that given Hasbro’s recent affection for stickers that they’d go the other way and opt for paint on the update. No complaining for me as it saves me time trying to press the terribly fitted and applied stickers edges back down. What you have here is a pretty effective homage to the vintage toy with an alt mode that recreates it in an almost parody fashion by squeezing into a more chibi style form. It’s annoyingly cute and easily passes the “swooshing it about making laser noises” test. In robot mode Cloudraker is a handsome facsimile of the original toy but shrunk down to legends size and squished. His shorter stature, more youthful face and squished proportions call to mind the minicons from the current Robots in Disguise cartoon and there’s a fun playfulness to him. With the fin on the back of the head he really reminds of a baby Dinobot Swoop in a school uniform. Everything follows the G1 template with the legs swinging into place and the arms swivelling to the sides of the body. What is pretty clever is the wings now curl round the backs of the lower legs to cover the gaps. That’s it, if you don’t count rotating the head as transformation step which you totally shouldn’t…but it totally is. Hasbro resurrected one of the hallmarks of G1 with the rub signs for all four clones figures and to maintain accuracy to the vintage clone toys each one is different. Cloudraker comes with one that reveals what I assume is a jet but my eyesight is terrible and it could just as well be a smudge of something from my dinner. Originally each bot also had the standard faction heat rub symbol, but here it’s paint. Which bots must be happy about because who want’s to have go around rubbing up another transformer to figure out not only whether they are friend or foe, but whether you’re going to need to have your bike tyres pumped up to persue them on the ground, or wave at them as they fly away? I don’t have Fastclash as judging by how difficult Hasbro have made those box sets to buy they don’t want me to own it, but it’s fairly easy to see that most of the parts are shared. Cloudraker comes out a lot cleaner owing to how his various parts all fold tidily away, but unless you are looking at them from the back they are pretty tough to separate. Which is the whole point of this madness, right? Articulation is pretty great and each joint is as tight as required. Colour matching ise better than the original toy managed, with the reds all being the same shade. Beige on the legs appears to be less beige than the originals according to the first picture I Googled, but i’ll live. Cloudraker is a really fun bot to pick up and mess with and the simplicity is a definite plus on a toy where the only negative I can think is that he doesn’t come with any guns. We got folding hands I guess….the legends equivalent of a Moonbase on a stick. Wingspan comes hurtling at you via a great impression of 80’s popsters- A Flock of Seagulls. Supposedly this is supposed to be an eagle or a hawk but I don’t think Attenborough’s going to be stomping his feet if people get it wrongs. Where Cloudraker is a smaller, squatter version of his past life, Wingspan’s alt mode differs a little from his ancestors – looking more like a bird for starters. It’s the same concept, flying plastic death bird cousin of that robot Owl from Clash of the Champions, but less blocky about it. Lovely detailed wings evoke metal feathers and are brushed with the sort of hot pink that Misfire has trademarked. Each wing has transformation hinges that also give you some options for posing. Wingspan’s bird feet also have the tiniest amount of movement with one tiny click backwards. It’s kinda charmingly pathetic? Any Titan Master can sit in the seat which sinks into Wingspans back and ride him like something out of Lord of Rings and there is a port on the top for a gun that isn’t included. You can plug a display stand in there if you wish for Wingspan to hang from it like a lamp. Hasbro have been very clever in getting four different alt modes out of more of less the same joints across both sets of clones. Wingspan’s unique element are his wings which fold up onto the side of his boots to leave the legs kibble free. Hasbro could have just given us a variation on Cloudraker’s wing transformation but they’ve thought it through to give each clone their own minor distinctions. It’s the sweet mixer in your tipple of choice. Gorgeous teal, dark blue and white pops right out of the 80’s even more strongly on the robot form. Strain your eyes you will spot that the torso details are almost identical on both Autobot and Decepticon clones with only one significant change. The central section is no longer a flip up seat and is in fact a piece exclusive to the Cons. Hasbro painted the rounded sections around waist white which distinguishes the two sets of clones from one another and has the bonus effect of making Wingspan look like he’s modelled his fashion sense from Simon Cowell’s pulled up trousers, whilst adding a Word Up style codpiece. New arms, legs and crotch compliment a handsome head to make sure visually the clones are different across factions. A lot of work has gone into this as really they could have just painted one body in different colours and people would probably have just been happy to see new clones but the more you look, the more differences you will spot. The legs alone feature four different colours, three of which come in the form of paint which Hasbro is usually super stingy with. Even the hands are painted. Did Hasbro’s usual team go on holiday and come back the end of Home Alone 2 “Kevin! You spent how much on paint apps?”, as the stand in designer runs around Central Park with a mad lady covered in pigeons. Articulation is good even though Wingspan lacks the foot and wrist joints that Cloudraker gained courtesy of his transformation/ All the limbs cling to tight joints and there are no QC problems whatsoever so there’s not really anything for me to moan about…but I will. Just like the others there are no weapons included which is a little disappointing as it’s not like these clones were budget priced affairs. Exclusive pricing pitches them between a Legend and a deluxe but there’s not “almost” a deluxes worth of plastic here. Would it have really required Hasbro to take a sledgehammer to their piggy bank to chuck in a couple of guns? You do get another rub symbol and this one reveals the United Nations flag…or a bird. Who knows. It would have been great to buy all the clones without having to engage in an Indiana Jones style adventure, but them’s the breaks. 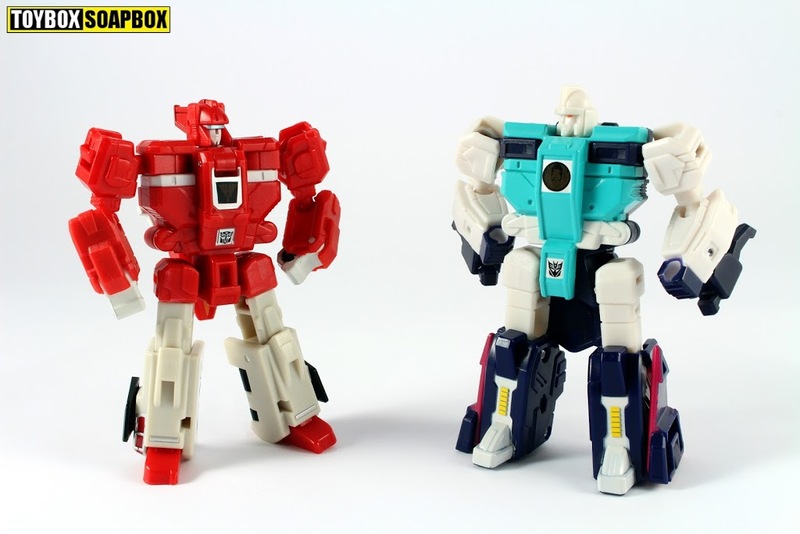 Hopefully Hasbro will release the other two in a more reasonable way butthese two has managed to satisfy my urges whilst I sit twiddling my thumbs waiting for a Takara announcement. As an update of vintage G1 toys these are about as perfect as you can ask for with clones being reflections of each other and being broadly the same but in different shades. For once retooling strengthens this bond between the,. Each figure is incredibly fun and the only real negative about these figures is that due to being tough to get hold of, not enough people will get to experience how great they are or will have spent so much on the secondary market to acquire the others that it will put a negative spin on them.